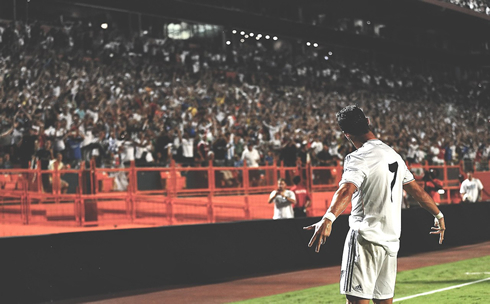 ﻿ Raúl: "Real Madrid couldn't have signed a better player than Cristiano Ronaldo"
21.08.2013 » Raúl: "Real Madrid couldn't have signed a better player than Ronaldo"
Raúl and Cristiano Ronaldo will meet again on the field this Thursday night, as Real Madrid prepares to host Al-Sadd for the Santiago Bernabéu yearly trophy. The eternal captain granted a few words in the preview of this match and had no problem in sharing his thoughts about several topics that concern the future of the Merengues. Real Madrid legend Raúl González Blanco is returning home this Thursday night, not exactly to sign a new contract with the club, but to participate in a friendly match between the Merengues and his current club, Al-Sadd. The two teams will face each other with the Santiago Bernabéu trophy on the line, but most of the spotlights will be pointing to the former Real Madrid forward. Raúl is excited to face his beloved club and doesn't hide the fact that this game will hold a very high emotional charge for him. The Spanish player is also expected to play on Real Madrid side during part of the game, which will be curious at least since at some point of the match we might see Cristiano Ronaldo and Raúl both wearing the number 7 jersey at the same time and while playing for the Merengues. In a press conference granted this past Wednesday, the Spanish international started by making a note on how happy he is to return to Madrid and how delighted he is to be given such an homage. Raúl: "Coming back now to the Santiago Bernabéu will be something very different and unique for me. It's going to be a very emotional game, that's for sure. I come here to play with Al-Sadd, a team who has a smaller level than Real Madrid, but I'm excited with the opportunity I'll be given to also wear the jersey from the club I defended with much pride in the past. Unfortunately, I couldn't say goodbye to the fans the way I wanted 3 years ago. This club gave me everything and I'll have to wait for tomorrow to see how I will react when the show starts...", noted the 36-year old forward. Before leaving Madrid and heading to Germany to play for Schalke 04, Raúl still had the opportunity to play with Cristiano Ronaldo for a full season (2009-10). Both players shared the same locker room under Manuel Pelegrini's orders and the Spanish forward confessed that he still has a big admiration for the Portuguese superstar. Raúl: "I hope to see a big party in the stadium tomorrow. I'm very happy because my family and my friends will all be there, and my sons will have the chance to see me playing for Real Madrid, with Cristiano Ronaldo by my side", remarked the former Atletico Madrid and Real Madrid striker. The summer transfer window will close in roughly 10 days and as it usually happens during this stage, rumors about new signings and departures come out quite often. In Madrid everyone seems to be convinced that it's only a matter of time until Gareth Bale puts ink to paper and becomes the Florentino Pérez new "Galactico". 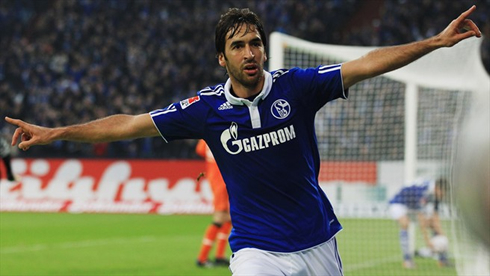 In response to that, Raúl has confirmed that the Welsh winger can very well turn out be a great addition to the club. Raúl: "Gareth Bale is a terrific player with a tremendous capability to beat opponents in 1-on-1 situations. He can make the difference just like Cristiano Ronaldo and Lionel Messi have been doing so far and that's why everyone is chasing him these days. It appears that Real Madrid is about to do a big effort to bring him to their ranks and if that ends up being happening, then everyone will be very happy as I'm sure the fans will enjoy a lot the contribution he'll give to the team...", pointed out Al-Sadd's number 7. The other hot topic in Madrid these days keeps being Cristiano Ronaldo's renewal process. Despite many indications from several newspapers suggesting that a deal was already made and was about to be announced, the truth is that everything remains the same and there are still no signs of white smoke in the Bernabéu chimney. Raúl defends the idea that the club should do whatever is needed to extend the bond with the 28-year old star, who he still regards as one of the best signings Real Madrid has made in the past years. Raúl: "I really hope that Cristiano Ronaldo continues playing for Real Madrid in the future! He has been by far one of the best signings this club has made in the last years. He always shows a great determination and simply doesn't get tired of winning. Every Madridista is waiting for some good news on this matter and we'll all be very happy if Ronaldo ends up extending his contract for a few more years", stated Raúl. Cristiano Ronaldo next game for Real Madrid will be against All-Sadd for the Santiago Bernabéu trophy, this next Thursday (August 22, 2013). In the meantime, you can watch Real Madrid vs Al-Sadd, Aston Villa vs Liverpool, Borussia Dortmund vs Werder Bremen and Dinamo Tbilisi vs Tottenham, all matches provided from our soccer stream section.